Un verano en Nueva York just got hotter. 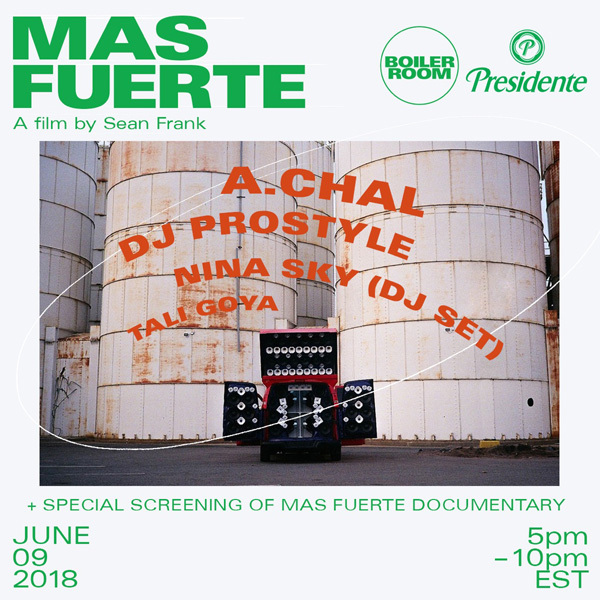 The good folks at Boiler Room have teamed up with Presidente Beer to celebrate the launch of Más Fuerte, a documentary by Sean Frank exploring Dominican sound system vans and the exchange of music, culture and traditions between Santo Domingo and NYC. In a nod to the quintessential sound system van party location, a defunct petrol facility will be transformed into a massive outdoor party. The day will include a full screening of the documentary, Dominican food and a lineup of artists representing the diversity of NYC sound system culture, which include Nina Sky, Uptown’s own Tali Goya, A.CHAL and Power 105.1’s DJ Prostyle. It all goes down on June 9, 2018 from 5 to 10 pm. If you can’t make it, you can also stream it live here: https://boilerroom.tv.